- Suitable for all capacitive touch screens, providing better touch for iPhone 8 / 7 / 7 Plus Red, All-New iPad 9.7 2017, iPad Pro 9.7 Inch, iPad Pro 12.9 Inch, iPad Pro 10.5 Inch(2017), iPad 1/2/3/4, iPad mini 1/2/3/4, iPad Air, iPad Air 2, Samsung Galaxy S9/ S9 Plus, Huawei, HTC, Google, LG and more. - With a clip design, clips easily to your carrying case, pocket, book, diary etc. KINDLY NOTICE: 1. Please allow 1-3mm differs due to manual measurement. 2. Due to the different display and different light, the picture may not reflect the actual color of the item,Thanks for your understanding. 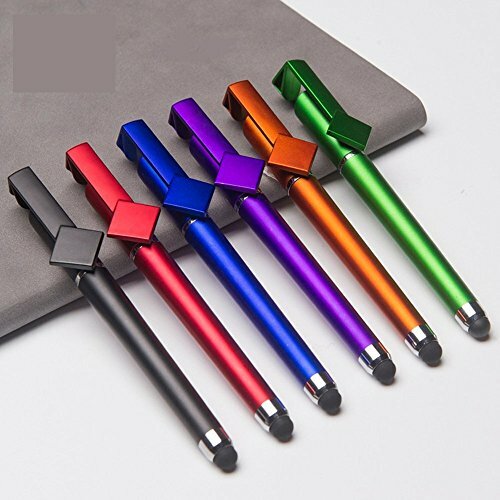 3 in 1: You can use it as a capacitive stylus, or a ballpoint pen, or a cell phone stand (Note: only support cellphones in horizontal version; Slot width: 13mm, Removable). Ultra Sensitive: With 7mm wide rubber tips, it is as sensitive as your finger in note taking, typing, writing, and navigating on your touch screen. OUR MISSION: We believe in Quality, Integrity and Simplicity! We aim to empower YOU so you can do MORE. As such, every product is backed by true quality assurance when it comes to replacements or refunds.